The purpose of this chapter is to determine the role of digital communication strategies in Torino digitally active museums. 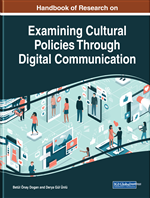 It describes strengths and weakness of museum digital communication practices, giving evidence on the awareness that museum managers have on the power of technology, data and automation to drive innovative digital communications. While some conceptual studies have highlighted the impact that digital technologies have on museums, empirical evidence on communication strategies, according to museum managers, is still missing. This research aims to fill this gap. The results show that digital communication is weakly linked to strategic dimension in the Torino museums, since it is conceived as a short-term operative tool, and it is not yet managed as a key resource to engage in dialogue with their publics. Results could provide new insight to directors and museum managers involved from the transformative and often disruptive power of digitization with the various spill-over effects on their business models. Nowadays digital communication offers tremendous opportunities for cultural institutions, representing a key strategic resource, since it is necessary to engage visitors, to obtain funding and to bind with local communities and all the museum’s stakeholders. Museums that strategically embrace the digital transformation will have powerful growth opportunities, connecting with audiences and achieving their missions in a successful way. This chapter focused on the communication strategies carried out by the managers of the museums in Torino, a city in the North-west of Italy. Torino is currently a post-industrial city: with Genova and Milano formed the so-called “industrial triangle”, influencing the whole Italian economy during the 20th century (Gallino, 2003). As many other European cities, from the Eighties Torino entered a crisis period due to the deindustrialization processes, starting, from the end of the Nineties, a general process of repositioning (Galdini, 2008; Scamuzzi, 2007) that included also a tourist development of the city (Gilli, 2015). In the meantime, the role of the museum institution has deeply changed all over the world. In fact, there has been a high growth of the number of the museums: along with the dramatic rise in cultural tourism in recent decades, the number of museums around the world has more than redoubled, increasing from 22,000 museums in 1975 to 55,000 museums today (https://en.unesco.org/themes/museums). Museums, which in the past were of little economic importance, have now started to play a very important role in the economic development of cities and regions. This transformation has mainly occurred thanks to tourism, which has become a key resource to overcome the post-industrial crisis (Gilli, 2015; Richards, 1996; 2001). In this phase of cultural and tourist renaissance, a great event held in Torino in 2016, namely “Museum 2026” developed a cultural hub that opens a window on the future of what will happen to the museum experiences and how these will directly influence the social and economic components of society, in a context of profound mutations, subversion of the concepts of art and science, with a strong interaction to the fourth industrial revolution. During the event, the city was proposed as a candidate for the European Center for the Future of Museums (ECFM) in the wake of great foreign experiences such as the American Center for the Future museum, inside the American Alliance of Museum; the Dubai Museum of the Future and the Brazilian Museum of Tomorrow. The Torino museum system has become the focal point of the regional cultural ecosystem, closely related to landscape and natural assets, which together represent a heritage linked to the future. In this scenario new digital technologies constitute an important tool for communication, attracting new resources and audiences (Gronemann et al., 2015). Museums are embracing new technologies to better understand their public and create a broader, more engaged customer base experience. Therefore, digital technology strategies provide a useful direction for museums to democratise access to culture (to different social levels, education, ethnicity, etc. ), open a space for dialogue and promote the exchange of knowledge in the pre-during-post steps of the visit (De Bernardi et al., 2018). However, to cross the bridge of the digital transformation, museums have to face with changing visitor demographics, their evolving expectations and an explosion of competing new entertainment options, so that they need to place at the centre of their communication strategies the digital proficiency to offer a more engaging journey for their audience (Antinucci, 2007; Bergamo et al., 2013). This has a huge impact on museum communication processes that become faster, bidirectional, customized according to the targets and exposed to continuous evaluation by third parties. The result of the pervasiveness of digital technologies in everyday life profoundly influence the receiver of the communication, who become interactive, able to quickly change the channel of communication and to express, in an immediate way, its level of satisfaction or dissatisfaction, evaluating independently, the truthfulness of a communication (fact checking). Museography: The study of the museum exhibit design area. Museology: The study of the history of the museum institution and of its changing role in the society during centuries. Museum Digital Technologies: They include the museum website, the museum social media and the digital technology used in the exhibit design. “Industrial Triangle”: The triangle formed by Torino, Milano and Genova, the three most important industrial cities in Italy. 2006 Winter Olympic Games: The Olympic Games held in 2006 in Torino that allowed the city to be internationally recognized as a tourist destination. Torino: A city in the North-west of Italy.